The Skowhegan graduate and Terriers sophomore has moved to center midfield after spending her freshman year at left back. 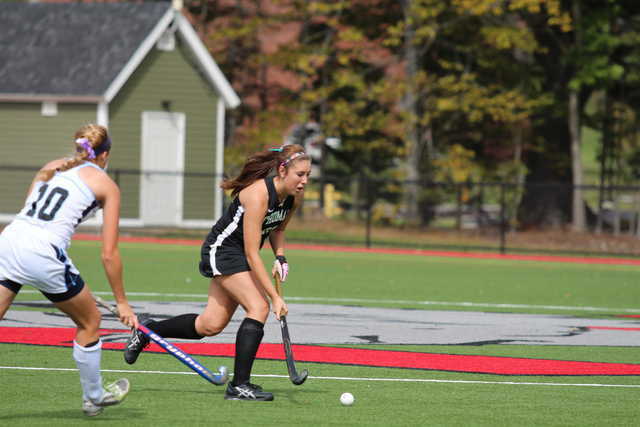 Thomas College sophomore Erica Blake has played a key role for the Terriers this season. WATERVILLE — Erica Blake says both Sacred Heart and the University of Maine — Division I field hockey schools — showed interest in her coming out of Skowhegan Area High School. But Blake ended up going to Division III Thomas College after a visit to the Waterville school. Blake started every game at left back as a freshman at Thomas last fall. This year, she starts at center midfield and has scored three goals in eight games. By nature, the center midfielder is the quarterback on the field, except the center mid must play both offense and defense at a high level. Though most of Blake’s experience is in the backfield, Thebarge said Blake’s skills and leadership would translate well to the midfield. Blake not only played back as a freshman at Thomas, she was also mainly a back at Skowhegan under coach Paula Doughty. Learning to be more of a leader is also part of Blake’s adjustment to the new position. The Terriers begin their North Atlantic Conference schedule with a home game Saturday against Husson. Thomas has won two in a row after a 1-5 start.